With our second visit to New York City marked, as always, with Broadway shows, great restaurants, world class museums, and more of the same, Watson and I were caught in a post-show period of hunger that demanded our immediate attention. A quick survey of the facts of the case (hunger, timing, impending rain, and sidewalks soon to be teeming with more like minded theatergoers) it was quickly decided that rather than chance our fate on an untested, unplanned visit to a shoppe in the area, perhaps a second visit to a previously visited sushi den that we had NOT yet documented might be more in order. And thus it was that we circled the block from 'Peter and The Star Catcher' on W. 47th St. and found ourselves in a wonderful little booth near the window at AOKI, which we attended to pre-Hugh Jackman in December 2011. With only two other tables hosting anyone at all, it was easily seen that the hostess chose to seat us near the window so as to draw the attention of those walking by thw window and wondering....'Is THIS PLACE' good at all? For as much as one would like to believe that a visit to NYC is rife with carefully detailed plans in chronological order, it is more one of happenstance and poor planning. So with literally hundreds of people emptied out into the streets after the evenings performances on Broadway it is fascinating to watch the scurry of all towards satisfying their most base instincts - hunger and thirst! Aoki, which was being marketed this particular evening very loudly on the corner of 48th and 8th by a burly, placard toting man wielding paper menu's for both AOKI and it's nearby Thai neighbor Saigon 48, offers the tired, weary, famished and parched, a wonderfully calm respite from the hustle and bustle of the big city. As only a quick stop-in and not a planned endeavor, we chose only two rolls: A Dragon Roll of eel, cucumber, and avocado topped with crab 'stick' and a Wasabi roll concocted of Tuna / Salmon / Yellowtail with avocado and topped with a wasabi caviar. 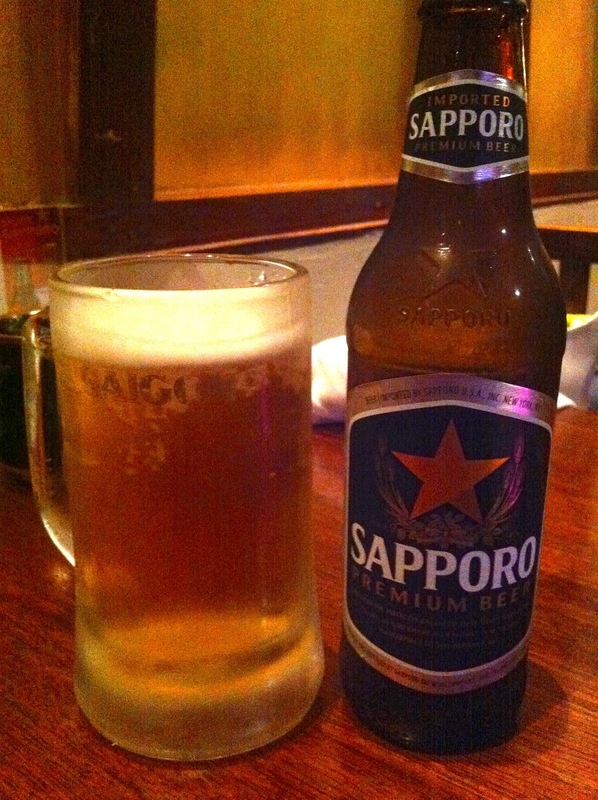 Both simple items for a sushi-domo and when delivered we were not disappointed. 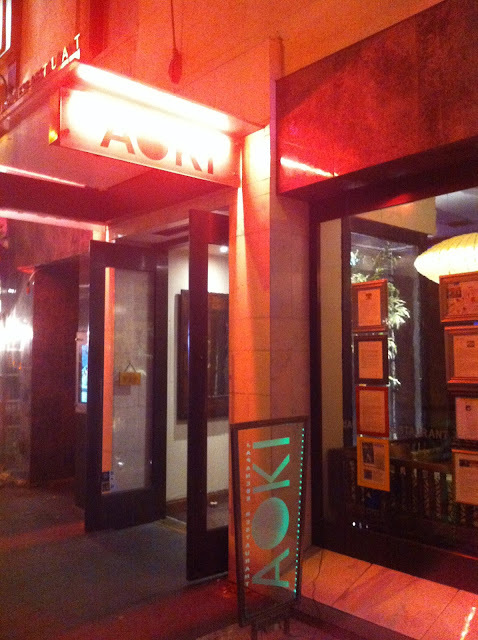 If ever in need of a sure thing without disappointment, AOKI does deliver what is needed. One surprising development occurred just prior to our decision to attend AOKI as we espied Bill and Melinda Gates of Microsoft fortune and fame standing next to us outside the theater with the tourists and theater mavens as if this was just as simple an exercise to attend the theater for the uber-rich as it is for those looking for the 50% off bargains at the TKTS booth (we do not recall seeing him on line that afternoon.) And perhaps it IS as easy as that! The theater treats us all one in the same and allows us to suspend reality for just a bit and, if we're truly lucky, to be transported entirely out of our senses. In this case also, and to the credit of both the native new Yorkers and the tourists inhabiting the theater that evening, not a commotion or fuss was made during the performance or outside the theater once over. The Gates' were allowed to simply enjoy themselves, as they should be....... to be traveling in cognito as the tourists that we all are in NYC......... an ELEMENTARY disguise, I must say!